We’re much more than an OT clinic. We’re problem solvers, educators, cheerleaders, and advocates. Whatever your child is struggling with, we’re here to help you create a clear path to success. After you fill out a few forms with information about your child, we schedule an initial meeting to deconstruct your child’s symptoms and try to understand the underlying issues that may be causing them. We also discuss any specific needs and concerns you may have regarding treatment. Following the parent consultation, we schedule a child evaluation, where we interact with your child and perform tests to better understand the challenges discussed at the parent consultation. This allows us to establish a baseline so we can determine the best treatment plan for your child. Our team combines their expertise and works collaboratively to brainstorm and develop a personalized course of treatment. We create targeted short-term and long-term goals aimed at helping your child develop, mature, and acquire practical skills he can use at home and in school. 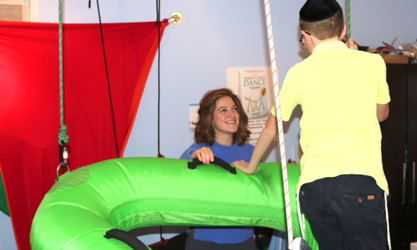 We put your child’s plan into action with the help of innovative therapeutic techniques, therapeutic games, and focused sessions in our fully-equipped sensory gym. Through continuous communication with caregivers, we constantly re-evaluate and adapt to ensure the highest chances of success.